During competitions, through the build season and help them to build their robots and their teams. We helped several high schools in our district to start their own FRC teams over the past few years and share many of our resources with them. 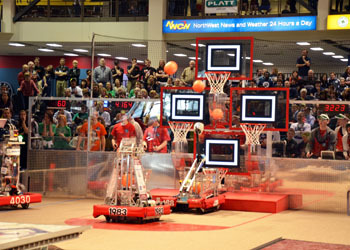 We held an FRC scrimmage in our gym last fall that was attended by many other local teams. It was fun to relax, play the game and talk robots and we hope to do it again in the future.it is very rewarding to share what we have learned and help other teams with their robots. Over the years we have enjoyed supporting new teams. We bring our robots to elementary schools throughout our district to generate interest in robotics and promote FLL robotics. 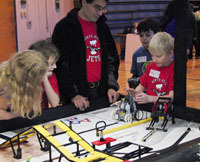 In the past we have hosted the Des Moines Regional FIRST Lego League in our gym. Over twenty teams would attend this regional. We have helped start FLL teams at several schools in our district and send out student members to aid and encourage these young students and promote FIRST. It's always fun to watch the teams our members have helped and cheer them on. Skunk Works has helped several elementary schools in the area with after-school programs to learn math and science. Our team members have met with groups of students after school to build robots using K’Nex and Lego Mindstorms NXT kits to teach them about robotics. 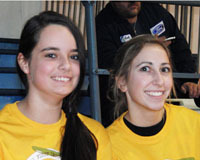 Students enjoy participating in these programs.